A distinct dark blue coat pattern. Intelligent, alert, active, loyal family dog. They excel in tracking and hunting. They require mental and physical activity to prevent boredom and destructive behavior. 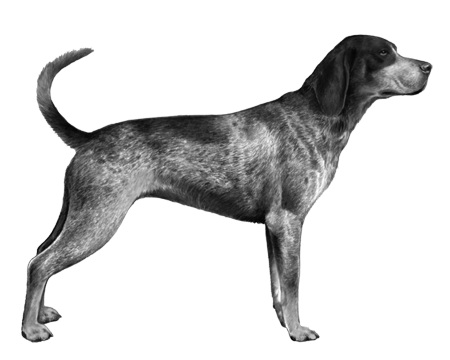 They are hounds and are natural hunters so they will run off, given the opportunity. 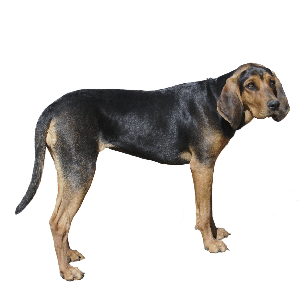 They do not get on with non-canine pets and some may be aggressive with other dogs though this can be reduced through firm, consistent training. 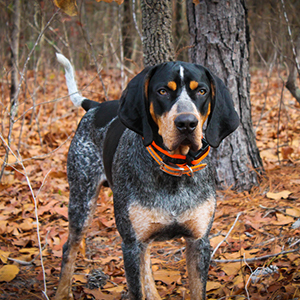 Although mostly bred in the southern states, the Bluetick Coonhound has a noble history – being the descendant of the French Grand Bleu de Gascogne and the English Foxhound. They get their name from their distinct dark blue coat pattern. And their reputation for being great trackers from their history of helping hunters by chasing raccoons, bears and cougars up trees. Although born hunting dogs, these affectionate pooches make great family pets too. They have many quirks to fall in love with, including their ‘bawling’ bark. 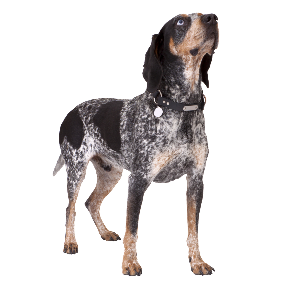 George Washington, who once owned Bluetick Coonhounds himself, described their musical voices as the ‘bells of Moscow’. We can’t guarantee your neighbours will be as appreciative.